These units of measure are listed from smallest to largest. 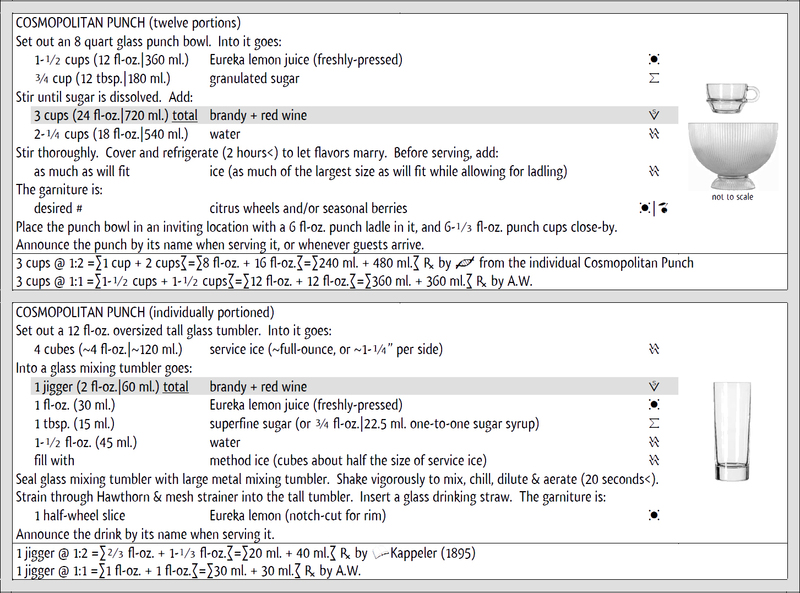 Bartending books often list units of measure larger than the largest unit given here and omit the smaller units. While it is fun to think of Jeroboams of Champagne, I feel that mixology can make more use of the scruple than the Jeroboam. For that reason, my list includes the small units and stops with the gallon. Note: I understand that many modern sources define the jigger as being the amount of 1-½ fl-oz. But, I prefer the original amount as defined by all sources before prohibition as being 2 fl-oz. For historic references on this, see this post. Smidgeon (smdg.) volume 0.15625 ml. ½ pinch, ¼ dsh. or ⅛ scsp. Pinch volume 0.3125 ml. 2 smdg., ½ dsh. or ⅛ bsp. Dash (dsh.) volume 0.625 ml. 2 pinches, ½ scsp., ¼ bsp. or ⅛ tsp. Scruple (scr.) weight 1.16667 grams 1/24 oz. Scruple-spoon (scsp.) volume 1.25 ml. 2 dsh., ½ bsp., ¼ tsp. 1/12 tbsp. or 1/24 fl-oz. Bar-spoon (bsp.) volume 2.5 ml. 2 scsp. or ½ tsp. Dram weight 3.5 grams 3 scr. or ⅛ oz. Fluid-dram volume 3.75 ml. 3 scsp., ¾ tsp., ¼ tbsp. or ⅛ fl-oz. Tea-spoon (tsp.) volume 5 ml. 2 bsp., ½ dsp., ⅓ tbsp. or ⅙ fl-oz. Dessert-spoon (dsp.) volume 10 ml. 2 tsp. or ⅓ fl-oz. Fifth volume 750 ml. 25 fl-oz. Traditional Fifth volume 768 ml. 25-⅗ fl-oz. or 1/5 gal. Pottle volume 1920 ml. 64 fl-oz., 2 qt. or ½ gal. 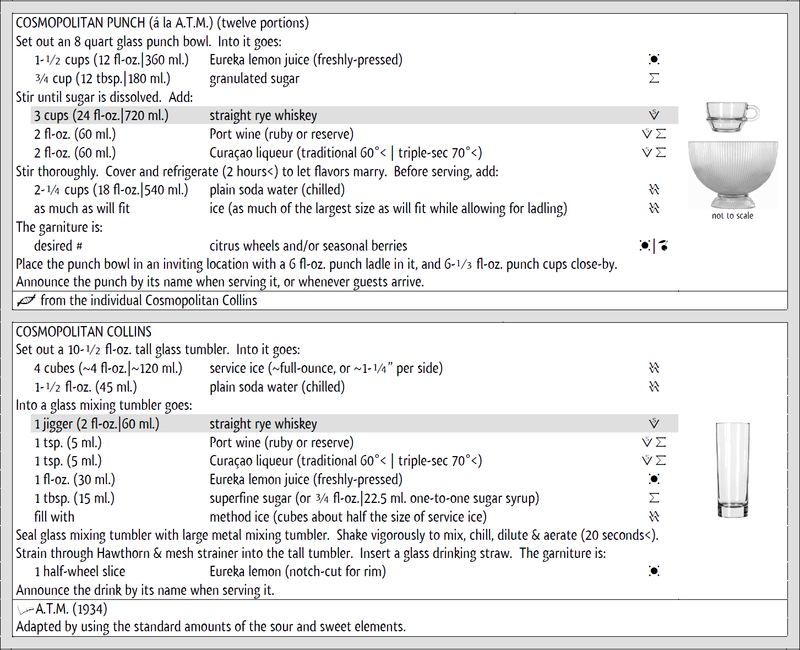 For how the cup, the gill and the jigger are used as basic portions in traditional, American mixology, see this post. #1, #2, #3, Enough! – I Am Not A Number! There was a time before drink books listed the #1, #2, #3, etc. versions of drinks. The reason is simple – before about 1910, drink books grouped drink recipes by types, or families, of drinks. After then, and especially after prohibition, the mistaken idea that all drinks were cocktails caused them all to be lumped together alphabetically. The everything’s-a-cocktail-lined-up-alphabetically phenomenon led to drinks-understanding being replaced by recipe-memorization. It also meant that bartenders could no longer look into a book to find out if there were a cocktail, or daisy, or any other specifically desired type of drink based on genever and modified by maraschino, for example. This sort of search by the type and essence of a drink is easily accomplished in my own book. It also has an alphabetical index for name searches. That is but one reason to buy it now at http://www.elementalmixology.com. In most of the simple-minded alphabetical books, any drink that the bartender doesn’t know the name of might as well not exist. This is why I often encounter, or read of, new drinks having been ‘invented’ that are actually old drinks. An otherwise competent bartender once presented what he thought was his creation to me at a new drinks competition that I was judging. The only thing new about it was his name for it. Since it was neither new nor his drink, he was not even considered for the winning spot – or its prize of cash. Beyond that, forcing all drinks to take on the family name of ‘cocktail’ has stripped drinks of their own family names (or surnames) and has led to the ignorant and unimaginative numbering system being applied to drinks of different types that happen to have the same first names (or given names). But, in the punch section of the book, Kappeler gives another drink with the same given name, but a different surname. It is clear that to Kappeler, the same liquors and bitters that would be stirred together with ice to make the Manhattan Cocktail could be shaken with lemon juice and ice to make a punch. Now, to tell the truth, I have never made, or otherwise tried, the Manhattan Punch. I wouldn’t be surprised if it turned out to be less-than-delicious. But the interesting point is that, if surnames are used, more than one drink may flourish under the same given name – just like in the case of people. I suppose that if, for some reason, the use of surnames were abandoned when applied to people, we might have to resort to John #1, John #2, John #3, etc. But, would anyone really want that? I have heard and read opinions about which of the drinks called Cosmopolitan, Corpse Reviver, Millionaire, and others, should be considered ‘the definitive one.’ How sad this is. Of the multiple people one may know with the same given name, what reason is there to consider any of them ‘the definitive one?’ Should Abraham Lincoln be forgotten and set aside in favor of the mythical Abraham of the Jewish scriptures, or vice-versa? There have been many, unrelated drinks with the given name of ‘cosmopolitan.’ As a name, it apparently occurred to a number of people in different places and times. Though not the oldest, I will begin with those that are slings – including true cocktails. In 1927, a recipe for a “Cosmopolitan” (without any surname) was published in the book Barflies and Cocktails. The book was essentially Harry McElhone’s 1922 book, The ABC’s of Mixing Cocktails with illustrations and new text by others added at the end. The “Cosmopolitan” was in the new material at the end of the text that was contributed by Arthur Moss. The fall of the cocktail had begun around 1910, when the earliest sources are found using the name for any drink served ‘up’ in a goblet. Many of the same sources omit the bitters in otherwise true cocktail recipes that had previously only ever been published as explicitly containing them. Since Moss’ Cosmopolitan was a cocktail in every key feature except containing bitters, I felt it was no problem to add them. The next recipe for a sling bearing the given name of ‘cosmopolitan’ was the Cosmopolitan Cocktail published in the book, American Travelling Mixologists, in 1934. This one was published as a cocktail, containing bitters from its very birth. Also in the same source was another drink called “Cosmopolitan” that happens to be a cup. Whereas the cocktail is a bittered sling, the cup is a wine-based sling. The oldest punch by the name, that I know of, was called the “Cosmopolitan Punch” in George Kappeler’s 1895 book, Modern American Drinks. Moving forward to 1934, a hot punch under the name “Cosmopolitan” was just one of the several drinks by the name found in American Travelling Mixologists. Also in American Travelling Mixologists, is found a “Cosmopolitan Punch.” Unlike Kappeler’s drink of the same name, it is a charged punch (or a Collins if made by the individual portion). When a punch is made ‘short’ (without added liquid water or water-based products) it will probably be either a sour served ‘up’ in a goblet, or a fix served ‘down’ with ice in a tumbler. A sour made fancy by being at least partially sweetened with liqueur as a modifying ingredient has been called a daisy in the nineteenth century (margarita means ‘daisy’ in Spanish, and the famous drink by that name is exactly this type of drink). The most famous drink bearing the given name of “cosmopolitan” is also a daisy. Where a daisy is a sour made fancy by liqueur, a lion is a sour made fancy by both liqueur and nectar or flavored syrup. Drinks fitting this description have been given the ‘lion’ surname as far back as 1862. The drink that was several years ago touted as a rediscovery of “the 1926 Cosmopolitan” turns out to be a lion. It is actually not found in any published work from 1926. I believe that the person who suggested that it was from 1926 made a simple, honest mistake in remembering where he had found the recipe. It was actually first published in American Travelling Mixologists in 1934. 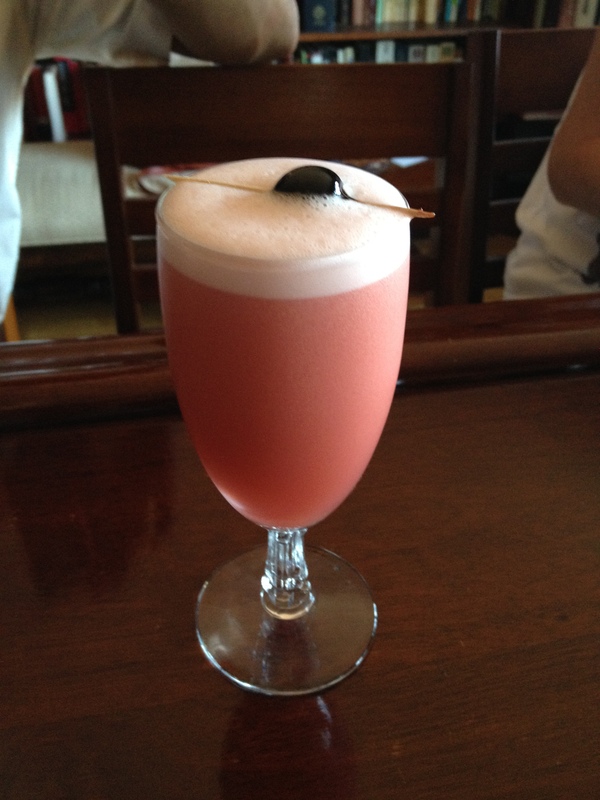 So when it comes to the “cosmopolitan” given name, there is a long history of drinks that are mostly unrelated. We can make, enjoy and talk about the Cosmopolitan Cocktail, the Cosmopolitan Cup, the Cosmopolitan Punch, the Cosmopolitan Collins, the Cosmopolitan Daisy and the Cosmopolitan Lion as the disparate drinks they are. There is no more reason to see them as related, or to reduce them to a single identity, than there would be to do so with John Locke, John Adams, John Lewis, John Belushi and John Candy. Surnames matter in both people and drinks. To know the surname that traditional, pre-prohibition American mixology would have applied to any drink is both suggestive of the qualities that will make it satisfying, and a good way to avoid confusion without resorting to the silly #1, #2, #3 system. Now make up a new drink and give it a traditional surname. If it turns out to be any good, tell me about it. If I know the surname of your drink, and you tell me just a little bit about the ingredients, I will be able to make it without needing a detailed recipe. That’s the power of traditional drink surnames. Do you know how your bar reckons its prices? Over the years, I have learned that many bars do not use, or even understand, kitchen math. This is true even of many bars within restaurants, where one must assume that at least the chef de cuisine uses kitchen math. Often, one finds the management of the bar simply winging it by getting a sense of what drinks cost at other, similar bars and perhaps only modifying that by what they believe their own customers will pay. The result is often that drinks are overpriced beyond any justification based on costs and overhead. As long as the owners are happy, this amateurish and costly (to the customer) state of affairs will probably continue. Any respectable culinary school will teach its students kitchen math, and that’s where I learned it. Kitchen math is what allows for the calculation of menu prices within a flourishing business. The ideal percentage of the money paid by the customers that is required to purchase the ingredients for what they have been served is called the menu cost percentage. The menu cost percentage can be arrived at by first establishing the desired profit percentage – the percentage of all money (not including taxes and tips) taken from the customers that is desired by the owners as profit. Let’s hope that they don’t have a proclivity for the use of South American nose powder. 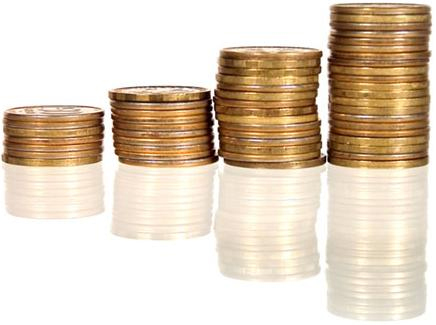 Secondly, the overhead cost percentage must be calculated – the percentage of all money (not including taxes and tips) taken from the customers that must be spent on the property lease-or-mortgage, property maintenance, labor, utilities, maintenance-and-replacement of equipment, cleaning supplies, office supplies, insurance, petty cash, etc. The percentage left over is the targeted menu cost percentage. Since a restaurant or bar cannot, in good faith, charge a customer for the accidentally over-cooked steak, the bottle of liquor that the bar-back dropped and broke, the items sent back by other customers, or the drinks served free-of-charge to the bartender’s friends that were not accounted for, the menu cost percentage for any amount of intake can vary from day to day. That is why the menu cost percentage is set as a goal, and why all well-managed establishments require that all ingredients be accounted for – even if they are wasted or end up being served free-of-charge. It is important to keep track of ingredient costs and to calculate the actual menu cost percentage routinely. As an example of the above, let us say that in a given day, an establishment took in $1,314.57 (not counting taxes or tips). Let us say that on that same day, the establishment used $260.81 worth of ingredients (including loss, wastage and ingredients that went into menu items not charged for). Dividing 260.81 by 1,314.57 gives us 0.1984. That means that on the day in question, the establishment ran an effective menu cost percentage of 20% – even though its targeted menu cost percentage was probably something like 18%. Considering that the hospitality industry generally does not pay very much for labor, it is my opinion that a menu cost percentage of lower than 16% is the result of sheer greed on the part of the owners, or the manager simply winging it at the expense of the customers. If the cost of the lease or mortgage is foolishly exorbitant, a lower menu cost percentage may be understandable – but that’s why it’s foolish to buy drinks in places where the cost of the local image is foolishly exorbitant. On the other extreme, a business with an actual operating menu cost percentage of much higher than 20% can eventually end up in financial distress. Once the targeted menu cost percentage is set, calculating menu prices can be done. 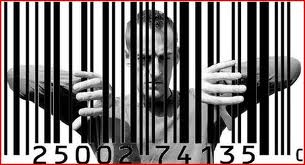 In kitchen math the word ‘cost’ is reserved for what the establishment pays, while the word ‘price’ is reserved for what the customer is to be charged. It is very simple. If the targeted menu cost percentage is a healthy-but-not-greedy 18%, it means that the total for the cost of all the ingredients in a menu item should be divided by 0.18. The result will be the minimum menu price for that item. The actual menu price can then be rounded up to the next whole quarter-dollar for currency-unit uniformity. In the interest of discretion, I have used current retail costs for all of the items below. This has made the drinks more expensive in these examples that they need be in a place of business. It means that the liquor costs include sales tax as applied in Los Angeles. The lemon cost is for relatively-small, organic, tree-ripened and un-waxed Eureka lemons from the farmers’ market that tend to yield 1 fl-oz. of juice each. The superfine baker’s sugar cost is as from Surfas in Culver City. The egg white cost is for a carton of organic and homogenized egg whites from Trader Joe’s (and more expensive than egg whites manually separated by a bartender from fresh, whole eggs). The method ice used in making the drinks is from water, which is already covered as a utility in the overhead costs. The garniture of a marasca cherry is per the cost found at Beverage Warehouse in Culver City. Again, it is important to stress that retail costs have been used here instead of the wholesale costs paid by restaurants and bars. If the sheets above were for an actual restaurant or bar (where the owners were not too greedy), the menu prices for these drinks, made with the same quality of ingredients, should be even lower. How do you feel about your bar’s drink prices? At any rate, I hope this post will help in the understanding of what goes into the rational setting of menu prices. I also hope that it may be of some assistance to those of my students and associates who own bars or now work in positions that might require kitchen math. Now, make yourself a drink, and start noodling. 1. Drinks Course (Abbreviated) – discount for two people: enter DCAFORTWO when checking out with a quantity of two for the Drinks Course (Abbreviated) and get a $25 discount! Do it here. 2. Drinks Course (Complete) – discount for two people: enter DCCFORTWO when checking out with a quantity of two for the Drinks Course (Complete) and get a $50 discount! Do it here. 3. Drinks Course (Complete) – $75 discount only for those who have already completed the Drinks Course (Abbreviated) and want to upgrade to Drinks Course (Complete). Bring your old book to the new course, since part of what makes this deal possible is not having to print up a new book. E-mail andrew@elementalmixology.com for the coupon code. 4. Liquor Course – discount for two people: enter LCFORTWO when checking out with a quantity of two for the Liquor Course and get a $50 discount! Do it here. The new Elemental Mixology storefront is now active. Visit it here to sign up for a course in Los Angeles, buy the book set and have it shipped to you, reserve a tool set (for pick-up only), or reserve your own selection of glassware (for pick-up only). P.S. If you are planning on picking up one of the tool sets or some glassware, it is strongly advised that you reserve it now through the storefront as supplies are steadily dwindling.